My name is Marie Lefebvre. I co-founded with Divya Pujara, Leicester Fixers in 2014 with the support of Footpaths, a carbon footprint project, Leicester Hackspace and Transition Leicester. Other little things about myself, I am not a repairer yet I am absolutely delighted every time an electrical item gets opened and I can see inside it. I am also a Ph.D student at Loughborough University investigating the propensity of users of stuff to repair. I love each and every Restart Party because I always learn something new and meet lovely people. What inspired you to start hosting Restart Parties in Leicester? What inspires you to keep on? It all started when a good friend, Zina, founder of Footpaths, a carbon reduction community project, and I decided to organise the first Green Festival of Making and Mending in Leicester in October 2015. Through the festival, we were inspired to disrupt people’s stories of the world and give them a glimpse that it is possible to make and mend items in an ingenious and more environmentally friendly way. Hence, somewhere in the middle of 2014, we started to dream away, about what the festival and all pre-festival events would include. I wanted an area dedicated to the repair of electrical and electronics items at the festival. I knew about the Restart Project and their resources to guided us in designing the Leicester Restart Party. I just needed people to help. So one day in 2014, I entered the Leicester Hackspace and I met Divya. He was keen to organise events to get members of the public to learn more about repair in order to reduce impacts on the environment and create greater awareness on what the Leicester Hackspace can offer. He was the perfect fit, he had great knowledge about electrical items, a natural ability to bring people together and was quite detailed and process-oriented. Together and with the support from the Leicester Hackspace, its members and Footpaths, we made it all reality and launched our first Restart in April 2015. We were ready for the numerous items going through our area and the 600 people attending the festival in October 2015. We have now run 11 Restart Parties and we are going to keep on going. There are many reasons that inspires me to keep going. One that resonates with me is that the Restart Party is a beautiful story of people coming together conscious of their strengths and weaknesses and ready to respond to a challenge, as a multifaceted as a broken item is. I want to keep this story alive, witness its growth and evolution. With all the challenges we facing i.e. global warming and the increasing amount of waste, we need gems of hope such as the Restart Party to remind us that things are changing. Did you know anything about tech or electronics before hosting Restart Parties? Have you learned more? I personally did not know anything about repair, tech or electronics before hosting Restart Parties. It is why I was keen to organise the festival as well as the Restart Parties. I have learned so much more since then. I have tried to repair my mobile phone with the help of a fixer. We failed miserably. It was an amazing experience though. Who knew what was inside my phone until I tried to open it? I have learned more about Linux by installing it on my computer and asking questions to individuals more knowledgeable than me. There are a bundle of things I have learnt particularly to do with the process, how to keep yourself safe when attempting a repair and where to seek help from. How did you go about finding volunteers? The volunteers are mainly from the Leicester Hackspace. We invite them to come and do their own repair until the space becomes filled with participants. We also give them plenty of tea and biscuits :). My involvement with Footpaths as well as Transition Leicester helped also to get from time to time more help particularly for the registration of participants. We are still looking for more volunteers, particularly in joining me and Divya to expand the reach of Leicester Fixers across Leicester. I would love to be able to do some presentations to various communities about the Restart Project and invite them to organise their own, hosting Restart Parties in other venues and creating bridges with repair shops in Leicester. I will be able to do so as soon as we have few more dreamers and doers with me and Divya. Do not hesitate to get in touch if interested to get involved particularly if you live in Leicester and have some space in your diary to allocate to us! I think for me it was at our Restart Party in May 2016. 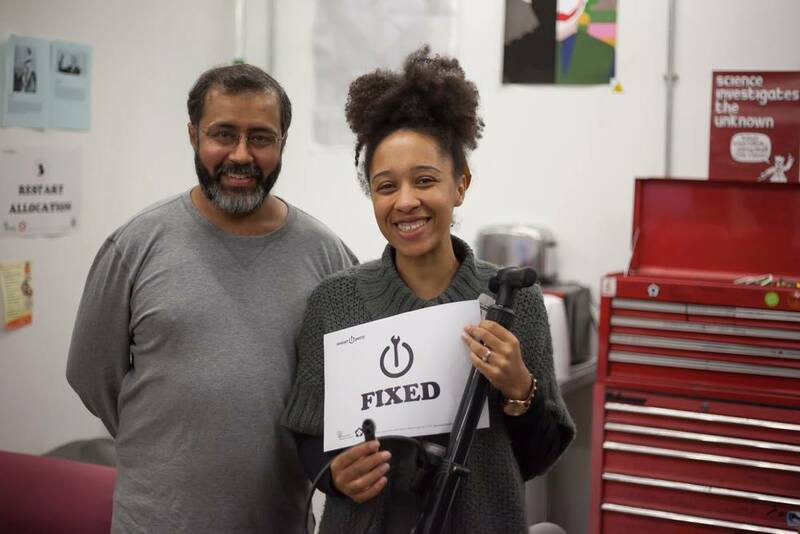 So far, we have had busy Restart Parties with a lot of fixers and participants ready to tinker. Yet, last Restart event was the quietest that we had in a long time. We repaired a WimHurst, tinkered with three other items and repaired my computer. Whilst the event normally starts at 1pm and finishes at 4pm, on that particular day with so few participants and fixers, we did not finish at 4pm. I found myself leaving the Hackspace after 9pm that evening. Time just stood still. It stopped as we enjoyed the activity, let ourselves transported by various conversations and liked being in the company of one another. This was really memorable. I wished after the event whether I could in the future return in this bubble more often and for longer. It definitely felt like going on holidays to some foreign place! A cool thing is that if you live in Leicester and use Facebook we have a Leicester Fix and Mend group to ask tips to repair your broken items, join us! How many products do you need to fix to break a world record? The repair cafe held in Cambridge earlier this month has set the new magic number: 232.